The trip went well. 1350 miles from home westbound over 3 days. All technical systems worked flawlessly. The Microsat WX3in1 TNC worked perfectly as a Tracker and I-Gate. The car network held up without issues. Amazingly enough, we entered a Verizon “extended 2G” coverage area along MO 60 just as my wife wanted to stream the Patriots game!! First half was lost, but the game was not so good anyway. We mourned the loss with a lot of Pats fans in Nashville that night. From Nashville, TN to home was sadly in very low visibility through some very pretty areas. We mainly barely saw tail-lights through the road spray. Not so much scenery. DMR via a SharkRF Opesnpot (v1) worked absolutely flawlessly. We have daily check-ins from N2KTO and LA9GHO checking on our progress. Gent’s – Thanks for keeping an eye on us! Conclusion 3000 miles in 8 days, of which 2 days was local in Branson. * An iPad provided a APRS Map and wide area navigation. * GPS for driving instructions. Turn info is repeated on the speedometer. * iPhone with map of truck stops, fuel, bathrooms and food. Not pictured is the XPR6550 ht I used to communicate on DMR. Also the CB we laid on the center armrest after we came to a complete stop on I-81 in PA after a major truck crash. Day 1 was not retrievable from APRS.fi Above picture picks up on the morning of Day 2 and shows all vehicle movements. 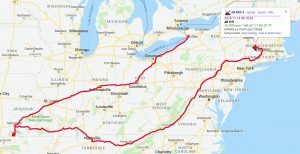 In November 2018 we are planning a drive from New England to Branson, MO, for a long weekend. Since it is vacation we are planning on driving the 1330 mile trip. One long day plus a “short” day. The hope is that most of the work symbols currently on the map will be gone by then (this map is live). This should bring the drive time down a little. Far Right: 15 minute timer after Alternator stops. 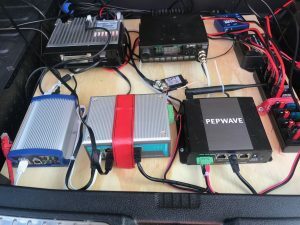 Left: WX3in1 APRS TNC. By far my favorite APRS tnc/controller. Middle: Moxa Mobile Ethernet Switch (see the text below). Currently not used due to VHF RFI. Right: Pewave MAX BR1 LTE Router. Dual Sim (service) Capable. Dashcam – Camera is installed. MOXA Switch is disconnected due to RFI. I suspect it is the stabilized power supply in the unit? 15 minute auto timer to turn off auxiliary system 15 minutes after alternator stops. I may swap this out for a 30-45 minute timer. 15 minutes is just a little shy for my taste. Router and Hotspot are in bypass and always powered. Only comm radios switched at this time. Distribution box in the trunk and between front seats. 12V voltage stabilizer for household items requiring stable 12v and not the variable up to 15+ volt I see from the APRS reports. The MB has a battery maintenance computer which carefully maintains the car’s battery at max performance. This, however also means the voltage will vary more than a standard car. The Router is a Pepwave MAX BR1 Industrial-Grade dual sim 4G LTE/3G Router with external antenna. The WAN connector will be used for the AT&T WHPI box. This router is capable of “docking” with a WiFi internet when not on the move. Thus, when at home, work or hotel, internet is supplied via WiFi while when on the move from 4G/LTE cell. The router remains continuously powered to maintain a stable internet. The docket mode also allows for remote control of some of the onboard radio systems like APRS and DMR HotSpot. A Moxa EDS305 commercial grade mobile (12-48Vdc) Moxa Switch is used to add more to add more LAN ports. I love this box; super forgiving on voltage, so a simple wire connection to PowerPole and car voltage. PROBLEM: The Moxa generates RF noise on VHF frequencies to the tune of full scale on the receiver on some frequencies. It appears to be completely unusable? New CAT7 shielded ethernet cables are on order. Our cell plan is for 30G + 10G carryover for the first 5 days of the trip before the plan resets for our drive back home. This should be plenty for the the trip even if we start streaming a football game or an occasional movie. This leaves the WAN port of the Pepwave in LAN mode and provides a Ethernet connection to the front as well. Typically, all portable equipment (phones, iPads etc) are connected with WiFi, but i find that router maintenance is better performed when wired. Always the controversial topic. Porky-pine or not? The key here is to remove “in transit” antennas when we arrive at the destination. NMO Larsen 2/70 will be used with a Connect Systems (CSI) CS800D dual band DMR/Analog mobile. Alternative will be Comet 2x4SR with optional spring. This has been a good wide-band antenna on my previous vehicle. NMO 4G/LTE stubby antenna on a mag mount will provide data connection. NMO 18″ Austin 500 dual band antenna with a duplexer for vhf APRS via RF and gain antenna for the UHF DMR Openspot. NMO CB Amtenna. We find that CB is still the preferred travel/traffic information system when the road backs up. Antenna will be in trunk ready for deployment. 4 Mag-mounts – can’t justify drilling into the MB. 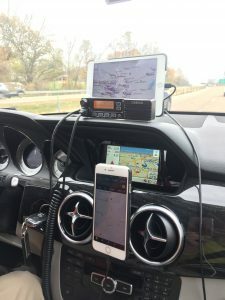 As an APRS fanatic, we will beacon our drive. Although I love RF based APRS, the base APRS functions (beacon and I-Gate) will be provided by a WX3in1 with Beta firmware (thank you Microsat for tailoring a Beta Firmware) which allows for smart beacon via APRS-IS. APRS RF will be available, but not primary. Currently the RF part is connected in receive / iGate mode, but not transmitting. You can follow our progress on N1ATP-1 Unfortunately, Google is now charging APRS.FI for maps so I can’t embed maps into this web-site. An experiment this time will be to mix RF and IS on N1ATP-1. This mode has been used for a couple of months and is functional. The dual function appears to work well in preliminary testing. A dual band DMR/Analog CSI CS800D is the primary radio. They key is what it will monitor?? When urban, we may be on a local DMR repeater?? We will monitor 312525 (one of my repeater TGs) unless in a active QSO on other TGs. 2 Hytera PD-362 mini DMR radios. Icom ID-92 for local ham use in Branson. We’ll have a few portable radios for use while in Branson on my (FCC Licensed) biz band or licensed GMRS freq’s. Our favorite online store had a Akaso V1 Dash Cam on sale for a acceptable price and with acceptable ratings. It has been installed with a remote wire kit and is hardly visible behind the mirror. So far, so good. As a guy who is usually out in the weather helping others, the vehicle kit also includes a Whelen mag-mount minibar and I added a 6-pack of LED road flares. Not convince they are bright enough, but anything helps. Each door pocket also has a safety vest for the unplanned stop. Some European countries require a safety vest to be within reach of the driver in case of a roadside stop on a dark road. Most of Europe also require a warning triangle. The funny part is that the German built GLK has a delivery charge item of removing this safety equipment. I wonder why? However, living in the boondocks without street light dodging the dog-walker dressed in dark clothing after dark, we are so familiar with the “near miss”. No reason to be roadside without some safety equipment!